At Orthopaedic Associates of St. Augustine, we offer a full range of treatments for osteoarthritis or inflammatory conditions of the hand or wrist. While we strive to use non-surgical methods where applicable, sometimes surgery is the most appropriate form of treatment. 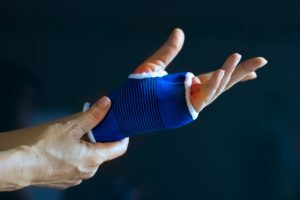 Depending on the specific ailment, surgery can involve the removal of scarred or diseased tissue, repair through the use of prosthetics, tendon reconstruction, or joint fusion. Reconstructive surgeries of the hand are best performed by a surgeon skilled in orthopaedic and hand surgery, like our own John B. Stark, MD. His wealth of experience and specialization in hand surgery make him one of the best reconstructive surgeons in the nation. Synovectomy –The removal of damaged or diseased tissue, a synovectomy is generally performed in the wrist. Arthritis may require removal of damaged bone as well. Sometimes coupled with tendon-transfer surgery, a synovectomy serves to restore comfort and functionality to the wrist joint. Joint Replacement – Similar to joint replacements in other areas; the affected joint areas are replaced with a synthetic joint in order to alleviate pain and replace the damaged bone. Joint Fusions – This process completely removes a joint from the hand, and stimulating the remaining bone to grow across the gap to form a solid segment of bone. This eliminates the painful area and retains much of the function of the hand. Surgeries generally last from one to two hours, depending on the location, severity, and type of procedure being performed. Most procedures are outpatient, and allow you to go home the same day. Then one to two weeks after surgery, rehabilitation restores full functionality to the affected joint. If hand or wrist pain has been preventing you from living life to the fullest, reconstructive surgery may be the answer. For more information about our hand and wrist reconstructive procedures, request an appointment online or call us at 904-825-0540.